When obstructive pulmonary disturbances are present, it makes sense to test the reversibility of the condition for purposes of differential diagnostics. Here, the test of pulmonary function is repeated after administering a bronchospasmolytic agent (rapid-acting β2 sympathomimetics or anticholinergics). bronchodilation plays a particularly important role in differentiating between asthma bronchiale and COPD, as well as in the evaluation of lung emphysema and air trapping. While reversibility is usually virtually complete with bronchial asthma, it is often not significant with COPD. In this case, the primary extent of obstruction must be considered. If, in the case of emphysema, the residual volume decreases or normalizes following bronchodilation, the result is called air trapping. A further cornerstone in the differential diagnostics of obstructive pulmonary diseases is the determination of TLCO, which is typically normal or increased with asthma bronchiale and decreased with COPD (transfer factor). Besides the correct application of the inhalative medication, already-applied bronchodilatatory premedication should especially be taken into consideration and if necessary temporarily suspended (rule of thumb). A negative bronchial spasmolysis test may not be equated with ineffectiveness of the antiobstructive therapy, nor does it allow prediction of whether the therapy has “taken” during the further course. A bronchodilation test is considered positive when FEV1 increases more than 200 ml and at least 12% compared to the initial value in adults. Here, we distinguish between partial and complete reversibility. 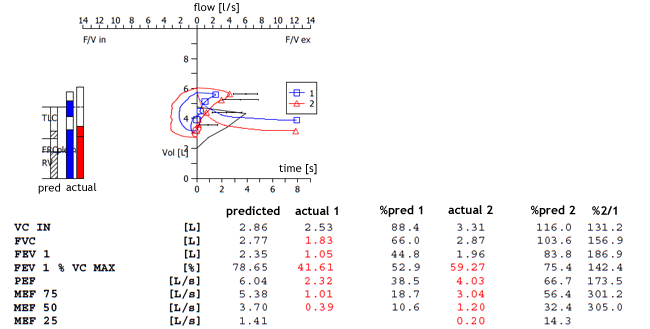 For determining the spirometric degree of severity of COPD, post-bronchodilatory FEV1 values are taken. 55-year-old female patient. FEV1/VC = 53% and FEV1=45% of the respective target value prior to bronchodilation (left). Post-bronchodilation there is significant bronchodilation success apparent, with an increase in FEV1 by 87% and 910 ml (right). 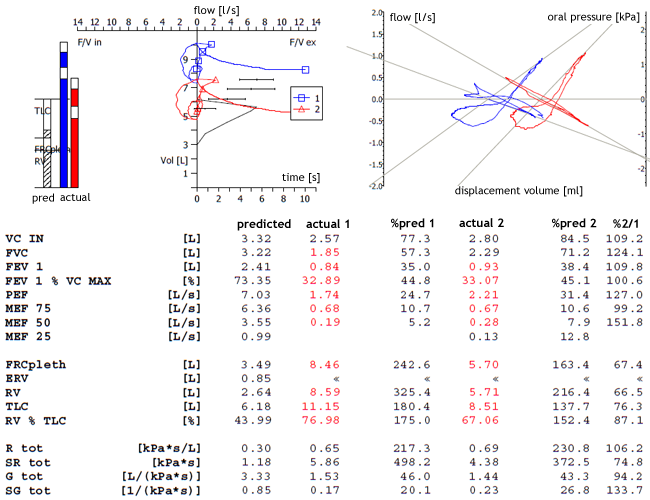 Findings: spirometric - mild obstruction. Significant bronchodilation success. 77-year-old male patient. FEV1=38% of the target value post-bronchodilatory (right). Increased residual volume RV to 325% of the target value; following bronchodilation, significant decrease to 216%. This shows that a portion of the measured RV is mobilizable by means of bronchodilation, thus indicating air trapping. The actual residual volume is anatomically fixed and cannot be influenced by bronchodilation. Findings: severe obstruction with no significant bronchodilation success. Severe emphysema and air trapping. For discontinuing the rapid-acting β2 sympathomimetics, a period of at least 6 hours is recommended prior to conducting the bronchodilation testing; for long-acting β2 sympathomimetics, 24 hours; anticholinergics 12(-24) hours; antihistamines 2 days and β receptor blockers 24 hours.